In 1979, two cognitive scientists, Francisco Varela and Eleanor Rosch, and a computer scientist named Newcomb Greenleaf — all freshly minted Buddhists — organized what was to be a groundbreaking conference at The Naropa Institute in Boulder, Colorado. Recently established by Tibetan meditation master Chögyam Trungpa Rinpoche, the institute was designed to be a place where meditation traditions and western scholarship would meet on common ground. The conference, entitled “Comparative Approaches to Cognition: Western and Buddhist,” would be an exciting convergence of East and West. While some participants remember it as stimulating in new and different ways, Rosch describes it as combative, an intellectual melee just short of chair-throwing. As she tells it, “We thought naively that the things we were discovering about mind through Buddhism were so meaningful and right-on that our colleagues would immediately want to sit down and discuss how this deep understanding of the mind fit into the various sciences. Wonderful things would happen. Instead, they looked at the thick reader we compiled, largely from Buddhist sources, and said, ‘What is this?’ When Francisco and the rest of us gave talks, they would say, ‘Huh?’ When the meditation sessions on the schedule failed to immediately provide the ‘information’ that they needed to ‘understand’ what we’d been saying, they reacted, ‘We’re at a conference and you’re asking us to sit here and do nothing?’ When it came time to discuss, they simply revolted. Clearly, we hadn’t gone where they were.” The Buddhism-science dialogue was off to a difficult start. Francico Varela, the conference’s leading light, was a walking Buddhism-science dialogue. As an undergraduate student in biology in his native Chile in the early sixties, he had burst into the office of professor Humberto Maturana and blurted out that he wanted to study “the role of mind in the universe.” Maturana, always a free-thinker, replied, “My boy, you’ve come to the right place.” The professor became his mentor and allowed him to explore notions about mind and body incorporating ideas from French phenomenology. Varela went on to Harvard and proved he had no fear of detail by earning his Ph.D. for a study of information processing in insect retinas. He was sure his career would take off in Salvador Allende’s new Chile, but not long after he returned home, the political tides turned, and he had to flee Colonel Augusto Pinochet’s military regime with only $100 in his pocket. Varela ended up back in the United States, and in 1974, at a point when he felt cast adrift, he encountered an old friend he had met while living in Boston, Jeremy Hayward, a physicist who was a student of Trungpa Rinpoche. Hayward arranged for Varela and Trungpa to meet, and when Varela let on that he was struggling to find what exactly to do, Trungpa Rinpoche offered to teach him how to “do nothing,” quite a feat for someone with a mind as active as Varela’s. When Rosch met Varela in the late seventies at one of Trungpa’s programs, she had just started practicing Buddhism. She had made some pioneering discoveries in the emerging field of cognitive psychology and, like Varela, she saw meditation as the ultimate research tool, the one she had been looking for all her life. The Naropa meeting whetted their appetites, but it left them wanting something more – and better. 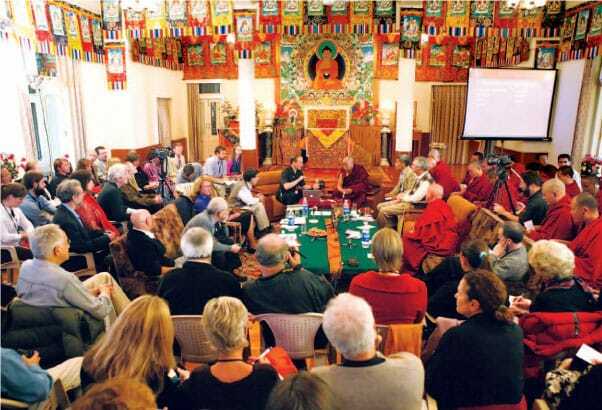 His Holiness the Dalai Lama and participants discuss neuroplasticity at the twelfth Mind and Life conference in Dharamsala, 2004. Photo (c) 2005 The Mind and Life Institute. Meanwhile, the man whose name is now listed as Tenzin Gyatso at the top of the roster in every Mind and Life meeting was quietly having discussions with scientists every chance he got. His Holiness the XIVth Dalai Lama grew up in a place of extremely advanced learning that was nevertheless unblessed by the hand of Western science and technology. Yet every book, every vehicle, every machine, every device that came to him from the West while he was growing up became an object of intense curiosity, something to tear apart and put back together. The world of mechanisms was meeting the world of meditation. When the Dalai Lama fled Tibet in 1959 at age twenty-four, he quickly saw how much the Western scientific ethos dominated affairs in the larger world. He had some catching up to do. He was determined to learn more and test what he knew, having just passed the difficult examinations for the Geshe Lharampa degree, the equivalent of a doctorate in Buddhist philosophy. Before the Dalai Lama became a celebrity and a Nobel Prize winner, he was a humble monk leading a country that didn’t have a seat at the United Nations. People didn’t defer to him the way they do now. Nevertheless, he was able to develop friendships with a number of prominent European scientists, who were quite kind to him and genuinely enjoyed his company as an interlocutor. One of the first was Carl von Weizsäcker, brother of the one-time president of West Germany and assistant to the quantum physics luminary Werner Heisenberg. For days at a time, von Weizsäcker would sit with the Dalai Lama tutoring him on quantum physics and its philosophical implications. His Holiness also had the good fortune to befriend the physicist David Bohm, who had spent a great deal of time with Krishnamurti. His Holiness carried on a decades-long conversation with Bohm that, in his words, “fueled my thinking about the ways Buddhist methods of inquiry may relate to those used in modern science.” He also developed a close relationship with Sir Karl Popper, the most prominent philosopher of science. He learned from Popper’s teachings how the logic of science relied on abstraction, usually in mathematical form, and instrumentation (microscopes, telescopes, etc.). By contrast, the logic of Buddhism relied on natural language and examples drawn from unmediated personal experience. Not all of the Dalai Lama’s interactions with science were so positive. In 1979, while Varela was wrestling with the crowd at Naropa, the Dalai Lama faced a hostile clutch of scientists at a conference in Russia, where one of them felt he was postulating the existence of a soul. If this dialogue was going to get off the ground, someone clearly had to draw up better terms of engagement. For his part, Varela was determined not to repeat what had occurred at the Naropa meeting, so he set down some guidelines for any future meeting about Buddhism and science: participants must not only be knowledgeable, they must have something to contribute and be open to dialogue. It would be a few more years, but he would get the chance to organize the kind of meeting he envisioned, and the Dalai Lama would be the one to make the difference. In 1983, now back in Chile, Varela traveled to a conference on science and spirituality in Austria, where he ended up sitting next to the Dalai Lama, who peppered him with questions about the brain. They were kindred spirits – a meditator who had come to science and a scientist who had come to meditation. They vowed to talk again. In 1985, Varela heard from his friend Joan Halifax of a plan hatched by businessman and Buddhist Adam Engle to hold a dialogue between the Dalai Lama and scientists about the shared ground between Buddhism and modern physics. Varela persuaded Engle that brain science would be a better place to start and they formed a partnership that led to the first Mind and Life meeting, “Dialogues between Buddhism and Cognitive Science,” held in Dharamsala, India, in October 1987. Varela was the scientific coordinator for the meeting, and he developed a template that called for a small, committed group of participants, each of whom would make a presentation on a different aspect of a topic area. 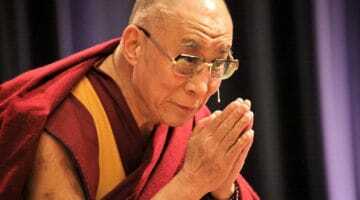 Discussion would be facilitated by the coordinator and the Dalai Lama would be an active participant throughout. This has been the format, with minor variation, for all twelve of the Mind and Life dialogues that have been held to date. 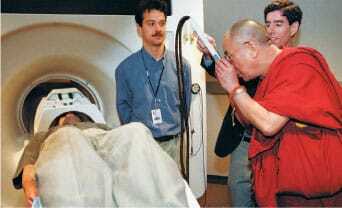 Richard Davidson, far right, demonstrates a PET scanner during the Dalai Lama’s tour of the Keck Laboratory at the University of Wisconsin at Madison. Photo by Jeff Miller. Several years after the first Mind and Life meeting, Varela found himself tromping around the mountains and caves above Dharamsala. He was there in an effort sanctioned by the Dalai Lama to use sophisticated instruments to measure what was going on when yogis meditated. His partner in that effort, Richard Davidson, was – and is – a leading authority on the relationship between brain and emotion and a pioneer in developing and applying techniques for measuring brain activity. He holds several academic chairs in psychology and psychiatry and is the director of the Laboratory for Affective Neuroscience and the W.M. Keck Laboratory for Functional Brain Imaging and Behavior at the University of Wisconsin at Madison. Richie Davidson, as he likes to be known, has long been interested in trying to demonstrate scientifically what meditation might do. In the early seventies, he was a Harvard colleague of Daniel Goleman, who would go on to become a champion of the principle of “emotional intelligence” and write a best-seller by that name. 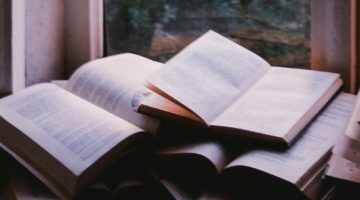 In their Harvard days, Davidson and Goleman co-authored a paper that argued that training attention through meditation would create “lasting and beneficial psychobiological changes.” While a layperson can rely on anecdotes and personal reports to determine whether or not there are “beneficial changes,” a scientist needs hard data. Fortunately, as Davidson’s career progressed, so did the science on brain function. The Society of Neuroscience, only established in 1970, would go on to become the largest and fastest-growing society in all of experimental biology. By the late eighties, neuroscientists were taking very detailed pictures of brain activity, and by the late nineties they were taking videos. Because of such advances in brain-imaging technology, researchers could now gather hard data about the beneficial effects of meditation. Talking about such data was one of the primary focuses of the 2000 Mind and Life conference, coordinated by Goleman, with Davidson, Varela, Paul Ekman, another prominent emotion researcher, and others in attendance. The results of that meeting, and a follow-up session the next year at Davidson’s lab, are the subject of Goleman’s book, Destructive Emotions. Davidson’s team and his collaborators have done two types of studies, one with people first learning to meditate and another with extremely experienced and adept practitioners. In the first kind of study, they are trying to find out what benefits accrue for someone whose meditation is regular but of limited duration. Jon Kabat-Zinn has done extensive research into the health benefits of mindfulness meditation and has long been involved with Mind and Life, so Davidson collaborated with him on a recent study of workers in a high-tech company who took a two-month training program in meditation. It showed significant changes in brain activity, declines in anxiety, and beneficial changes in immune function. Paul Ekman, unlike Davidson and Kabat-Zinn, has had no long-term interest in meditators or meditation. Ekman, who recently retired as the head of the Human Interaction Laboratory at the University of California at San Francisco, studied the emotions for fifty years. He more or less stumbled into his recent involvement in studying meditators. “It all started with the meeting in Dharamsala,” he recently told me. “I only went to the meeting because my daughter had lived in a Tibetan refugee camp in Nepal and was very moved by the cause. I thought it would be a great treat for her to meet the Dalai Lama. Now, having met the Dalai Lama myself, I’ve developed an interest in what he’s doing, for what I can learn both as a person and as a scientist. 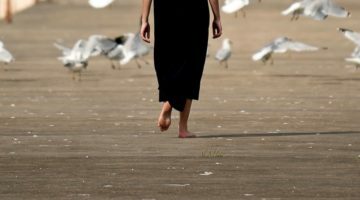 “When I completed my training 45 years ago, my supervisor said, ‘If you can increase the gap between impulse and action, you will benefit your patient.’ He didn’t know that’s a straight Buddhist view: the spark before the flame. That may be a place where through practices of one kind or another, it may be possible to do what nature did not intend for you to do, to become a spectator of yourself and decide whether you want to go along with it, and if so in what fashion.” Some think this convergence of neuroscientific thinking and Buddhist teachings is extraordinary. In the abhidharma (sometimes called “Buddhist psychology”) one is said to solidify experience through a chain of twelve mental events known as the nidanas. Some masters teach that the chain can be broken at the moment between “craving” and “attachment,” and unconditioned, open experience can occur in that gap. As a result of the 2000 Mind and Life meeting and at the behest of the Dalai Lama, Ekman agreed to launch the Extraordinary Persons Project. His main subject in a precursor to this project was someone who has also been studied extensively in Davidson’s lab, the monk and fellow Mind and Life interlocutor Matthieu Ricard. A long-time meditator, Ricard served for twelve years as aide and translator for the great Dzogchen master Dilgo Khyentse Rinpoche. Ekman’s specialty, developed over years of painstaking study of minute movements of the face, is the Facial Action Coding System, a method of cataloging emotions based on minute changes in facial muscles, such as raising the inner eyebrows, tightening the eyelids, or lowering the corners of the mouth. How well someone can detect such microexpressions is regarded as an indication of empathy, as well as a skill that enables one to uncover deception and ill-intent. Consequently, Ekman has been vigorously sought out to help law enforcement and anti-terror agencies. Ekman was curious to see whether meditators, who might be expected to be more attentive and conscientious, would do well at detecting lightning-fast changes in facial expressions. When presented with a videotape showing a fleeting series of facial expressions that one must correlate with an emotion, Ricard and another meditator scored higher than any of the five thousand other people tested. As reported in Destructive Emotions, Ekman said, “They do better than policemen, lawyers, psychiatrists, customs officials, judges – even Secret Service Agents,” the group that had previously held top honors. What Ekman and Davidson have discovered in their research has nothing to do with holding a Buddhist worldview. For his part, Davidson says, “I am a hard-nosed Western neuroscientist. The level of description of mind and the level of description of brain are very different, but I also believe that mind depends on brain and without brain there is no mind.” While in Buddhism, mind transcends embodiment, as evidenced by reincarnation, in neuroscience mind or consciousness is considered an “emergent property”; it just pops up where there are brains. Ekman and Davidson and the Buddhists they’ve been talking to seem not at all focused on who’s right and who’s wrong. The methodologies of science and Buddhism are mutually respected. For example, the fact that the notion of “mood” appears to have no formal place in Buddhist teachings and yet is a widely used notion by laypeople, clinicians, and researchers in the West is leading both Buddhist teachers and scientists to think about how they study and teach. In today’s Buddhism and science dialogue, insights are not so bound up with authorship. Who discussed the virtue of having “elasticity of mind”? The Buddha? No. Charles Darwin, in The Expression of Emotion in Man and Animals. Immunoflorescent light micrograph of brain cells from the cortex of a mammalian brain. 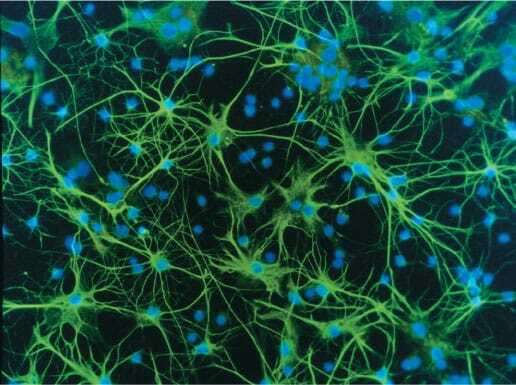 The star-shaped cells, astocytes, provide support and nutrition to nerve cells, and may also play a role in information storage. Matthieu Ricard started his professional life as a molecular biologist. Now, after many decades as a monk, his molecules have become the subject of study for biologists. His discussions with physicist Trinh Xuan Thuan, published as The Quantum and the Lotus, and his vigorous give-and-take with his father, the renowned philosopher Jean-François Revel, published as The Monk and the Philosopher (a best-seller in France) demonstrate his ability to discuss Buddhist understanding deftly outside the context of Buddhism. This has made him an ideal participant in Mind and Life dialogues and a laboratory subject who can report his subjective experience with scalpel-like precision. In his concluding statement in The Quantum and the Lotus, Ricard says that one of the main reasons that “science has been led into a dialogue with Buddhism” is the dilemma that has emerged through quantum mechanics and relativity of “trying to reconcile the apparent reality of the macrocosm with the disappearance of solid reality as soon as we enter the world of particles.” Arthur Zajonc (rhymes with science), editor of The New Physics and Cosmology: Dialogues with the Dalai Lama, is a physicist who has peered, at times side by side with the Dalai Lama, into the topsy-turvy world that lies far beneath the naked eye. 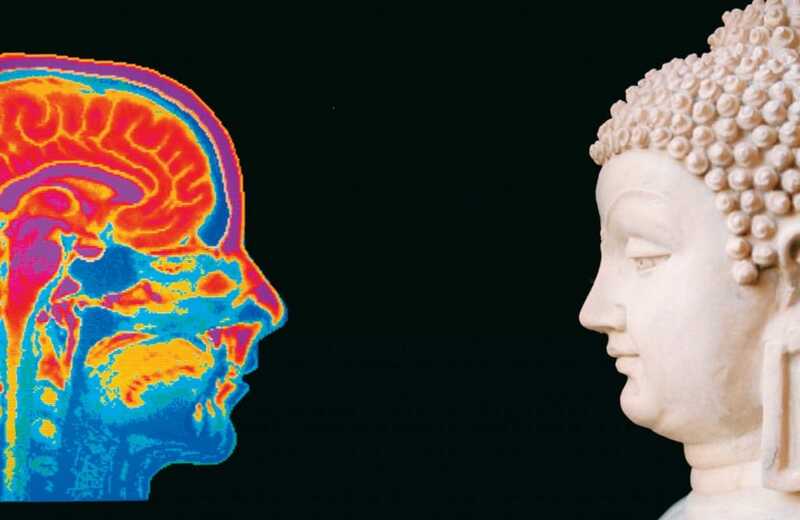 Zajonc notes that there is a kind of natural kinship between Buddhism and neuroscience, since Buddhism has had so much to say about the mind and can provide reliable evidence of effectiveness. “When you switch over to the physical sciences,” he says, “you are in a very different territory.” Buddhism could be said to offer a science of the mind, but there is nothing in Buddhism that looks much like the highly mathematical world of Western physics. If physics were limited to predicting what happens when a hammer hits a nail, there wouldn’t be much to talk about, but because physicists since Einstein have strayed into looking into the nature of reality, it engages the philosophical side of Buddhism and doctrines like emptiness of inherent nature and codependent origination. The philosophical convergences lead to seminars like “Quantum Nonlocality & Emptiness in Madhyamika Prasangika,” recently presented by physics professor Vic Mansfield as part of the Namgyal Buddhism and Science Dialogue. Buddhists and cosmologists can also get into a tangle on the beginning of the universe, since Buddhists are into beginninglessness. At the same time, notions of time seem to provide a point of convergence, since many Buddhist teachings upset conventional notions of time in the same way as the principle of relativity does. On this point, Zajonc is passionate. “At the beginning of our scientific revolution,” he says, “there was division of labor. Science would take care of natural knowledge. All ethical considerations would be given to the church. The yogi knows that this is not actually possible. Knowledge brings power. As a scientist, you have the power, but you should also know the value of interconnectedness. When the genetic researcher Eric Lander was in dialogue with the Dalai Lama, he was struck when the Dalai Lama asked about the intention behind it all. Science has an ethic of leaving intention out of the picture, but with the nuclear problem and biotechnology, we find ourselves with moral dilemmas that our Enlightenment worldview is not fully able to handle. Eleanor Rosch is skeptical about the Buddhism and science dialogue. She thinks it may be heading in an unhelpful direction. “For many it’s not a dialogue,” she says. “There’s a frenzy about this kind of thing. I get frequent e-mails from people who want to study meditation from the scientific point of view so they can ‘get rid of all that mystical Eastern stuff and find out what’s really going on’ – by which they mean neurons firing in the brain and similar functions. Then there are Buddhists who want to ‘prove’ that meditation ‘works.’ Often research shows more about the preconceptions of the researchers and audience than it does about the mind. For example, what metaphysical beliefs might you harbor that would make you wildly excited to learn that when people pay attention in meditation, they show the same pattern of brain activity as when they pay attention anywhere else? Rather than scientists and Buddhists stretching their minds together, I see Buddhism frequently colonized as a feel-good, flat-abs caricature of itself no different from any other materialist reductionist doctrine. Questions about fortifying materialistic thinking and the possibility of co-opting Buddhism will undoubtedly remain. Some will question whether this dialogue helps in the development of a genuine contemplative tradition, as Arthur Zajonc seems to believe, or may lead us away from it, as Eleanor Rosch suggests. But the research will go on. Grant applications for research at prominent institutions like the National Institutes of Health, MIT, and Princeton that contain “mindfulness” or “meditation” are no longer scoffed at, and research centers focusing on meditation are likely to spring up. Alan Wallace, a former Buddhist monk who studied with Arthur Zajonc, has been an interpreter and an active participant in every Mind and Life conference. He is also the author of the anthology Buddhism and Science and recently founded the Santa Barbara Institute for Consciousness Studies. The institute has picked up on work that Paul Ekman was doing at the behest of the Dalai Lama on “cultivating emotional balance,” and is training schoolteachers, nurses, and other health professionals in “secularized meditation” techniques and other forms of working with emotions. The Mindful Attention Program will study whether meditation can aid people with attention deficiency hyperactivity disorder. Finally, the Shamatha Project will observe people meditating in a special facility over the course of a year. Paul Ekman, who is on the board of the Santa Barbara Institute, is excited about this study, but he says, it’s the “second-best study.” The best study, he says, would be “to do something like what was done in the famous studies of cardiac disease, where they started with 4,000 people. If we started to look at 4,000 teenagers in the Bay Area, and studied them every few years, inevitably some of them would get involved with meditation. We would have known what they were like and who it was who got involved. Then, we would follow them for the next twenty-five years. That is the research that needs to be done. On March 24, 2000, Francisco Varela took the floor in the Dalai Lama’s meeting hall to give the last of his many presentations in the dialogue between Buddhists and scientists that he had done so much to get started. On the verge of tears, in his gestures and soft words he implicitly thanked the Dalai Lama for making it possible for him to be there. Several years earlier, when he was dying of cancer, he had been ambivalent about receiving a liver transplant. Suddenly he received a fax from the Dalai Lama encouraging him to prolong his life. Now, although frail, he was back in action, flashing a PowerPoint slide onto the screen. He made the case for Buddhists and neuroscientists to collaborate for the good of the human race, a case he had been making for more than twenty years, since a time when there were few people actually called neuroscientists, a time when people were laughing him out of the building. By the time the proceedings were published, he would be dead, but the movement he helped to start flourishes.